Porcelanosa’s revolutionary KRION® K-LIFE was recently recognized as a Product Innovation by The Center for Health Design. The Center for Health Design is a community that consists of the leading trade professionals that specialize in the design and development of healthcare facilities. The Product Innovation Highlight covers the composition of KRION®, it’s unique properties and certifications, and shows a variety of projects that utilize KRION® all over the world. Click here to read the product highlight! 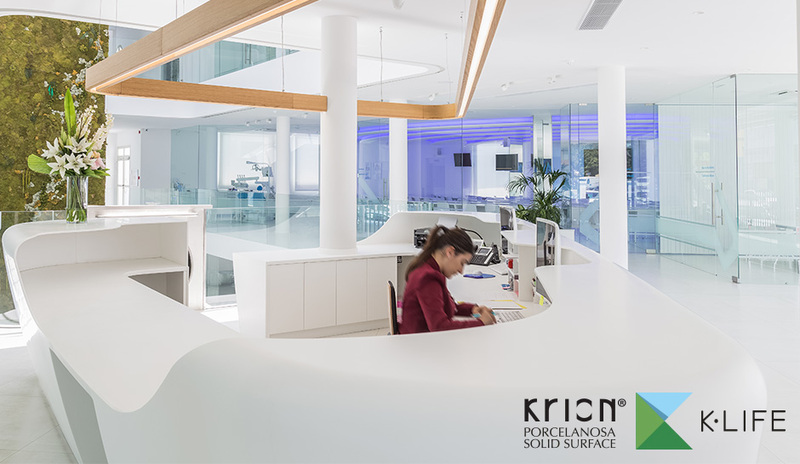 Inspired by the properties of photocatalytic materials, Porcelanosa has evolved their KRION® Solid Surface material, now called K-LIFE. When K-LIFE comes into contact with light, it will be able to purify the air, expel harmful bacteria, and more. K-LIFE can easily be integrated into many applications – from wall coverings and claddings for ceilings, to custom tables, bars, sinks, shelving units and furniture. The application of K-LIFE in areas with high daily traffic, such as waiting rooms or reception areas, can assure a gradual decontamination of germs and lead to ongoing ecological benefits. Some research performed with KRION® K-LIFE, which has photocatalytic properties, proved that the material can significantly reduce the presence of bacteria. This revolutionary process has led to a patent pending, innovative, and exclusive product that will have a direct effect on our quality of life. Contact us for more information on KRION® K-LIFE.